“Improving doctrinal scholarship” is the mission of this new King James edition. This year, for the first time in the history of the Church, Latter-day Saints will have an edition of the King James Bible whose references and supplementary material reflect the unique illuminations shed on it through our modern-day scriptures. The publication this fall of this historic new edition of the King James Bible crowns the efforts of hundreds of workers and the General Authorities who have directed them, efforts that have lasted almost seven years. The Bible has always been very important to Latter-day Saints. Indeed, we might say that the Restoration began when the teenaged Joseph Smith followed James’s counsel to “ask of God, that giveth to all men liberally” (James 1:5). In addition to the Bible’s early impact on Joseph Smith, nearly all early members of the Church were familiar with the Bible. Many of them had studied the New Testament and concluded that its truths were not being taught on earth. These same early members subsequently recognized with joy the glad tidings of the gospel’s restoration, a restoration that greatly increased their understanding of the Bible message and their faith in it. This understanding increased steadily as the Prophet Joseph Smith spent much of his limited time revising essential passages in the King James translation and sharing those insights with members of the Church. This new edition of the Bible will be a powerful aid in that process of discovery and rediscovery. Not one word of the King James text has been changed in this edition. What has been added, under authorization from the First Presidency, is chapter and verse designations at the top of the pages, new explanatory chapter headings, new cross references to all volumes in the standard works, over six hundred quotations from the Joseph Smith Translation (popularly known as Joseph Smith’s “Inspired Version” of the Bible) that illuminate difficult verses in the King James version, new language notes, a 750-category topical guide that makes the new Bible edition an incalculably valuable resource for discovery and study, a revised Bible dictionary with information especially useful to Latter-day Saints, and a valuable 24-page section of four-color maps. The color coding on this sample page shows what the new edition offers. 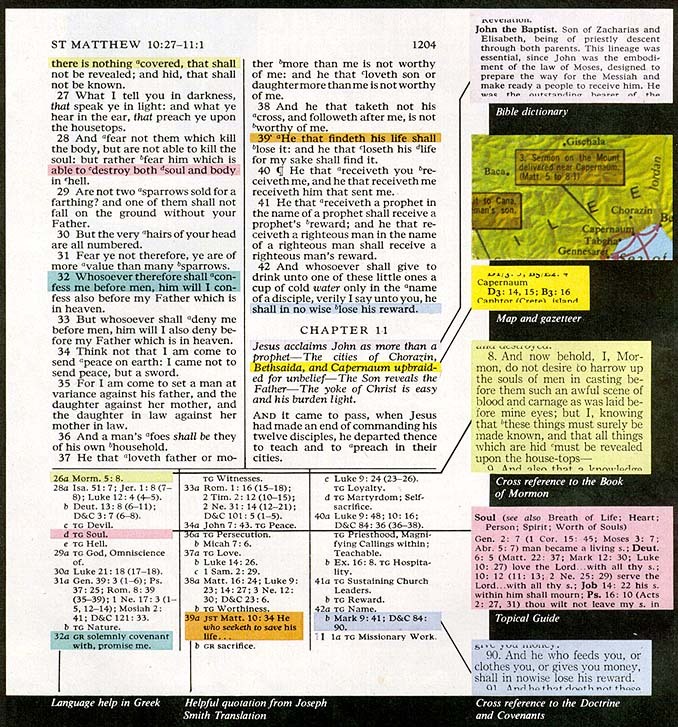 Match the colored lines in the Bible text with the corresponding colors at the bottom or side of the page. You’ll notice that not all the textual helps are found at the bottom of the page﻿—some refer the reader further to other books of scripture or to the topical guide, dictionary, and map sections in the back of the Bible. Two new styles of this new edition﻿—called B and C﻿—will be available in all Deseret Book stores and their outlets and in all English-speaking Church Distribution Centers by Christmas. Style A will be available in Deseret Book outlets only. Bishops and branch presidents will have information on placing orders by December 1. All three styles have identical contents from the title page to the last map. All three styles will come in two sizes: regular (4 3/4 by 7 inches) and large print (6 1/8 by 9 1/4 inches), and will be available in black and brown. The new volumes will be a quarter-inch thicker than the LDS missionary editions that members have now. The average King James Bible is between 1,500 and 1,600 pages long; this new edition will be 2,432 pages. The Old Testament takes 1,184 pages; the New Testament takes 406; the appendix material accounts for 822 pages; and a few preliminary and division pages make up the total. Style C will be bound in imitation leather, have page edges sprayed with gold paint, and is expected to sell for about $7–$9 (regular) and about $10.50–$12.50 (large-print). Style B is bound in top-grain cowhide, has imitation gold foil on the edges, uses non-rag, light-weight paper, and is expected to sell for about $13.50–$17.50 (regular) and about $18–$22 (large-print). Style A will be sold only in a matched set with the current triple combination through Deseret Book’s commercial outlets. Bound in water buffalo calfskin on fine Bible paper with a high rag content, it will have gold leaf edging, bound-in ribbon bookmarks, and thumb-indexing. (Thumb-indexing is an expensive hand process. It involves first marking the sections covered by each tab, then clamping the book into position, making a separate cut for each section, and last, applying pressure-sensitive thumb-tabs individually with tweezers. The thumb-indexed set is expected to sell for about $69.50 (regular), about $95.95 (large-print); without thumb-indexing the set is expected to sell for about $62.95 and $89.25. It will also be available in white and in blue covers. The first press runs call for 55,000 copies of Style A in regular and 17,000 in large-print, 175,000 copies of Style A in regular and 145,000 in large-print, and 275,000 copies of Style C in regular and 95,000 in large-print. Nothing was simple about this project. The publisher is the Church; the Corporation of the President, the Church’s corporate entity, holds the copyright; three General Authorities constituting the Scriptures Publication Committee represented the publisher on all detail work; all policy decisions were made by the First Presidency and the Quorum of the Twelve, and Deseret Book acted as the publisher’s agent in handling the typesetting, printing, and binding. Several forces converged to make the need for an LDS edition of the Bible apparent in the early 1970s. When the scriptures themselves﻿—not the manuals about them﻿—became the adult curriculum of the Church in 1972 and when Seminaries and Institute curriculum began concentrating more heavily on the scriptures, the inconvenience of a variety of King James editions became apparent. The desire for “a Bible of our own” developed at the grassroots and came together in what was then the Internal Communications Department, then managed by J. Thomas Fyans, who was later to be called as an Assistant to the Council of the Twelve. Elder Thomas S. Monson, Elder Boyd K. Packer, and Elder Marvin J. Ashton were assigned as Elder Fyans’s advisers. Daniel H. Ludlow, then director of Church Correlation, was an important participant in the early deliberations. Convinced that a new edition of the scriptures would be helpful, the committee took the project to the Council of the Twelve. Elder Spencer W. Kimball, then acting president of the Twelve, presented the project to the First Presidency and received President Joseph Fielding Smith’s approval. Letters dated 27 October 1972 arrived in the offices of Ellis T. Rasmussen, knowledgeable in Hebrew, and Robert C. Patch, equally knowledgeable in Greek, both of BYU’s College of Religious Instruction. Signed by Elder Spencer W. Kimball, the letters invited them to become part of a committee with a special task: “to prepare a King James Bible which would include a standardized concordance, dictionary, atlas, and index and … have footnotes, ready references, and cross references related to other L.D.S. scriptures.” Its purpose would be to “assist in improving doctrinal scholarship throughout the Church” from Primary children through adults. The committee, chaired by Elder Monson, launched the work with this basic charge: “Help people understand the Bible.” That first meeting was in January 1973. Robert J. Matthews later added his expertise in the Doctrine and Covenants, Pearl of Great Price, and Joseph Smith’s translation of the Bible. Originally, the project was envisioned as lasting a year or two. As it turned out, it took six years and nine months. Why did it take so long? There were three reasons: the scope of the project expanded enormously﻿—from preparing new helps for the Bible to preparing new editions of all four of the standard works. A second reason was the desire to do it right. Many dedicated, devoted people spent literally thousands of hours looking up every cross reference in existing concordances, making new lists, and refining them, running the cross reference through another mind and another computer check, and refining again﻿—a process that took the bulk of the time between 1974 and 1978. Third, the project was a labor of love. Aside from the computer programmer, the terminal operators, and one or two research assistants, all volunteered their time, necessitating much reshuffling as assignments changed. Special arrangements with Brigham Young University relieved Brother Patch and Brother Rasmussen of their teaching and administrative duties from January 1973 to August 1974. Roy W. Doxey, then dean of the College of Religious Instruction, invited the religion faculty’s cooperation in processing the thousands and thousands of notes and references. And then other things began to fall into place. Eldin Ricks, working on an expansion of a concordance, had already undertaken a project of putting all four of the standard works into the computer’s memory bank, a project completed by BYU’s Translation Sciences Institute. Now every word was available for instant retrieval and display on the computer video screen. But just having the computer print out all occurrences of Zion in the four standard works would not provide the kind of cross-references needed. The committee wanted a cross-reference for every passage where there was some matter of doctrinal or historical importance involving some problem upon which another passage would shed light. To solve problems in cross-referencing, three projects began simultaneously in March 1973. One set of volunteers began checking the existing cross-references in the most thoroughly referenced edition of the King James Bible to see how helpful the references were. Another set of volunteers began evaluating existing editions that explained obscure or archaic terms. And still another team was combing concordances, indexes, and reference works for a list of topics and subjects that should appear in a ready reference. No list was complete, so they made their own. It had nearly 1,000 topics in it, later pruned to 650, and then, during final work by a special task committee on the topical guide and concordance, increased to about 750. The Joseph Smith Building at BYU acquired its own computer video screen terminal in June 1973, and by September 21, over 7,000 data cards had been processed. By September 1973, Elder Bruce R. McConkie was assigned to replace Elder Ashton. Meanwhile, at BYU, 110 returned missionaries were called to help identify key words and key concepts in important scriptures in every book of the Bible. After these identifications had been made﻿—producing some 13,000 data cards to add to a previously processed 7,000﻿—Brother Patch and Brother Rasmussen went over the list to winnow out the less significant references, and it went into the computer again. That project took the whole school year. In April 1974, Brother Rasmussen’s committee reported back on its work: the subject index now bulged with 19,900 scripture entries under 741 different subjects; the cross-referencing survey had been completed for ten books of the Bible with the others still being worked on. The language notes were under way but not yet final. (At that stage, the concordance was separate from the subject index; both would later be combined into the topical guide.) All 24,000 key words were ready for computer printout with the excerpts in which they were found﻿—but this listing too would require editing and refining. In May 1974, as the school year closed, Brother Joe J. Christensen, then associate commissioner of Church Education, put the committee in touch with seminary and institute teachers in Utah and Idaho. Some of their resources went into reinforcing the cross-references from the triple combination to the Bible; others worked on the topical guide. The next month, in June, the committee reported the scope of their work to the First Presidency. Elder Kimball was now President of the Church and he wanted to know how long the rest of the project might take. The committee estimated that preparing the material would take through 1976. The technical work of typesetting, proofreading, printing, and binding would take another two years. The next two years were not easy. Dozens of sections of the Bible and successive generations of processed cross-references went back and forth between the committee and the hundreds of workers. What were they doing? Carefully, patiently, they prepared cross-references that identified important subjects or helped solve doctrinal or historical problems for potentially every verse in the Bible. The committee evaluated each item for significance and relevance and asked other workers to check the results against their own scriptural knowledge and teaching experience. Were all the best references there? And were only the best references there? Many people like Kelly Ogden and Tom Sederberg helped with the work. Tom, an undergraduate and returned missionary from South Africa, was one of the first people called in 1973. Six years later, in April 1979, he turned over the last of his cross-references on the Doctrine and Covenants. During those six years, he went to school full time, held other Church callings, married (he and his wife work on the project together now), worked in Minneapolis for eight months before joining BYU’s civil engineering faculty, and still spent between five and ten hours a week on the project﻿—somewhere between 1,300 and 2,000 total hours﻿—even taking bundles of computer printouts home with him during summers and vacations and steadily refusing even a modest honorarium. Six years sounds slow, but it would have taken longer without the aid of computers. A similar project on another edition of the Bible﻿—compiling only cross-references to other books within the Bible﻿—took over ten years for ten or twelve people working full time. Most of the credit for the skillful and flexible use of the computer belongs to Steven C. Howes, a “pioneer in programming,” who is now working for BYU’s Translation Sciences Institute. Brother Rasmussen says, “I remember asking things like this: ‘Steve, do you think we could get the computer to set type for the topical guide, change the words marked with asterisks to boldface, eliminate word fragments on the end of the excerpts, and repeat titles on topics covering more than one page?’ and Steve’s invariable response was ‘Of course!’” He saved literally thousands of dollars for the project by running programs between 2 and 4 A.M. when the computer rate was reduced sometimes as much as ninety-five percent. Meanwhile, William James Mortimer, then vice-president and general manager of Deseret Book, now general manager of Deseret Press, searched for ideal typesetting facilities. Bible typesetting has its own peculiar challenges, but many firms, when contacted, insisted that they could accomplish the task with ease. It was finally determined that the typesetting would be done by Cambridge University Press in England, which, in contrast, realistically acknowledged from the beginning that it would be a formidable task. Cambridge, however, offered the skills of craftsmanship and the experience of publishing King James Bibles since the earliest editions in 1611. Modern techniques of computerized typesetting seemed appealing, but when all the problems of fitting the verses on a page with their exact cross-references on the same page were weighed, the “old fashioned” technique of hot metal monotype was finally chosen. Cambridge University Press “went all out” to accommodate the needs of the project, Brother Mortimer said. “Even with their superior abilities, though,” he continued, “I still think we have helped them learn a few things. For instance, several months ago the manager of Cambridge’s New York office flew here to Salt Lake to negotiate some difficult cost overruns and other financial matters. Before leaving New York he was advised by telex message from the Cambridge manager in charge of our work in England: ‘Remember Alma 7:23.’” (This passage from the Book of Mormon advises: “Be humble, and be submissive and gentle; easy to be entreated; full of patience and long-suffering; … asking for whatsoever things ye stand in need; … always returning thanks unto God for whatsoever things ye do receive.”) “With those kinds of instructions, how could our meeting go wrong?” Brother Mortimer laughed. A fourth problem was simply size. It was being set in hot metal monotype﻿—each letter and each character separate within a line so that a single comma could be changed without requiring that the line be reset. By Mr. Coleman’s estimate, that made roughly eight and a half million pieces of metal. And each word of text was proofread five times﻿—twice by a team reading aloud against copy and three times by a single proofreader﻿—not counting the proofreading done by Deseret Book as well. Readers will probably first notice new chapter headings summarizing the contents of each chapter rather than the running heads along the page tops of previous versions. Prepared by Elder McConkie, these headings are especially helpful to Latter-day Saints. For example, the chapter heading for Isaiah 29 links this prophecy to the Nephites and the Book of Mormon, which Isaiah is saying will come forth in the future. “The typesetters had a few questions for us on that one!” said Sister Knowles. The running heads have been replaced by inclusive references to the specific verses on that page﻿—for example, the heading “2 Samuel 11:12–12:1” makes clear the precise chapters and verses on that page. The footnote system itself is so simple and flexible that the press may recommend it to other Bible customers. Elder McConkie, when it was presented to him, exclaimed, “Why hasn’t anyone thought of this before?” Footnotes within a verse of the text are indicated by the letters a, b, c, and so on, depending on the number of references the verse contains. Cross-references for that footnote letter are identified at the foot of the page by chapter number (in boldface type), by verse number and by individual internal reference. Because the numbering system is self-contained for each verse, any future changes can be made without having to renumber every following reference﻿—a disadvantage of the system currently used in the triple combination. Another form of reference is JST﻿—the Joseph Smith Translation of the Bible. For the first time in the history of the Church, a selection of passages from this work will be readily available to members of the Church in a Bible edition. (The Pearl of Great Price contains two excerpts﻿—the book of Moses and JS—M.) Joseph Smith began in earnest his work on the translation in June 1830﻿—only two months after the Church was organized﻿—and worked on it consistently until July 1833. He continued to make refinements throughout the Kirtland and Nauvoo periods. Joseph Smith’s Bible translation was never published in its entirety nor was it completely finished during his lifetime, but it presents many clarifications and explanations of Bible doctrines and makes us understand better the scope of Joseph Smith’s mission as the prophet of the restoration of all things. The Reorganized Church of Jesus Christ of Latter Day Saints kindly gave permission to use their printed editions of the inspired version of the Bible in this work. Some short excerpts from the JST﻿—up to six lines﻿—appear as footnotes, but other sources refer the reader to the appendix where long passages are cited more fully, the changes unique to the Joseph Smith Translation appearing in italics so that the reader can see at a glance its doctrinal contributions. This section, about six hundred passages filling seventeen pages, was mainly the work of Brother Matthews. Another broadly useful note is TG﻿—the topical guide which adds a chunky 598 pages to the total length. Some readers may be familiar with the hardbound Topical Guide published by Deseret Book in 1977. It has topic headings such as JUSTICE in large type, a list of scriptural references running down the left hand column (“Job 4:17”) and the phrase containing that key word on the right with the key word in boldface type (“shall mortal man be more just than God?”). In use for two years, it contained a sheet requesting comments, additional topics that should not be overlooked, important references within topics that had somehow been omitted, etc. The sheets returned by readers were extremely important in preparing the final form of the Bible’s topical guide. The original book had 624 topics; and the new topical guide and selected concordance contains about 2,500 entries, not including “see also” references. Work on the Topical Guide moved into high gear in January 1978 when a special task committee was called. The chairman was Alma Gardiner, who had retired from Seminaries and Institutes. Other members were George A. Horton, Jr., director of curriculum for the Church Education System, Edward J. Brandt of the Salt Lake Institute, Bruce Harper of Church Editing, and Sister Knowles. The committee worked from 7 A.M. to 12 noon every day from March through June at the Deseret Book offices, with additional work at home in the evenings and on weekends and holidays. They used standard Bible concordances and other sources, plus the published Topical Guide and a full computer printout. The first change was abandoning the single-reference-per-line format of the book. In the Bible, the references appear in double columns in paragraph style, with boldface to set off each book of scripture and italics to designate keywords. The simplicity of the section is that it combines topics, index, and concordance in one. The Bible Dictionary, all 196 pages and 1,285 entries of it, was mainly the responsibility of Brother Matthews. The Church received permission from the Cambridge University Press to use its dictionary﻿—the one appearing in missionary editions﻿—as the base. It identifies places and people, provides historical background in light of such recent discoveries as the Dead Sea Scrolls, and explains language and cultural items, including the English words whose meanings have changed (anon, Matt. 13:20, means “immediately”). Cambridge University Press appreciated the thorough editing by Sister Knowles and Brother Matthews, who identified several incorrect references in the Cambridge Dictionary. Another major help for Latter-day Saints is a harmony of the events in the life of Christ that includes not only the four gospels, but 3 Nephi and relevant references to the Doctrine and Covenants. Brother Patch did most of the work on this harmony. One of the nation’s leading mapmakers, Hammond, Inc., of New Jersey, has provided twenty-four pages of topographical maps, beginning with a physical map of Palestine and ending with Paul’s journey to Rome. A ten-page gazetteer indexes all of the maps so that the reader can quickly look up the location of any place, mountain, or river mentioned anywhere in his reading. These new editions of the triple combination are currently undergoing the same arduous preparation and exhaustive checking and rechecking that the Bible did. The Doctrine and Covenants and Pearl of Great Price are ready for typesetting, and work on the Book of Mormon has commenced. Publication is tentatively scheduled for 1981, according to Brother Mortimer, former general manager of Deseret Book. The Bible’s topical guide and dictionary, containing references to all four standard works, will serve for the triple combination as well; but each modern scripture will have a revised and enlarged index. New historical headnotes, reflecting increased knowledge of the background of the revelations, are projected for the Doctrine and Covenants. Also, new content outlines have been written that are expected to appear in paragraph form and one-column width at the beginning of each revelation. And for the first time, maps are planned that will show some important sites of early Church history. The Articles of Faith, presently available in new editions, are slightly modified for clarification (Example: “We believe … that Zion will be built on the American continent,” rather than the previous “this (the American) continent.”) The Pearl of Great Price is also expected to receive a revised concordance and index, and a new introduction explaining its historical background. New introductory material, newly written chapter headings, and new cross-references are also projected for the Book of Mormon. Not only will this new edition be helpful to the individual student reading at home, but there’s never been a better classroom edition. For the first time, the teacher will be able to have his class turn rapidly to a given page number rather than waiting while they search for a book title. Also, as Brother Matthews pointed out, with the topical guide, references, and dictionary in the Bible, the new historical headings in the Doctrine and Covenants and Pearl of Great Price, future lesson manuals won’t need to be so large. The project involved one of the newest developments of technology and one of the oldest. Shown are pieces of hot metal monotype resting on top of a computer printout.